We started our push up challenge with our previous exercise, the wall push ups and continue today with incline push ups. Make sure you can overcome the Final level of wall push ups, before attempting the inclined ones. You’ll need a sturdy and reliable object, like home furniture, half of your height – up to about hip level. Table, high chair or a kitchen worktop are all good options. If the height of the bearing surface is located precisely at the middle of the body, then your body will be at an angle of 45° to the floor. Breathing out, slowly return to the starting position and repeat. 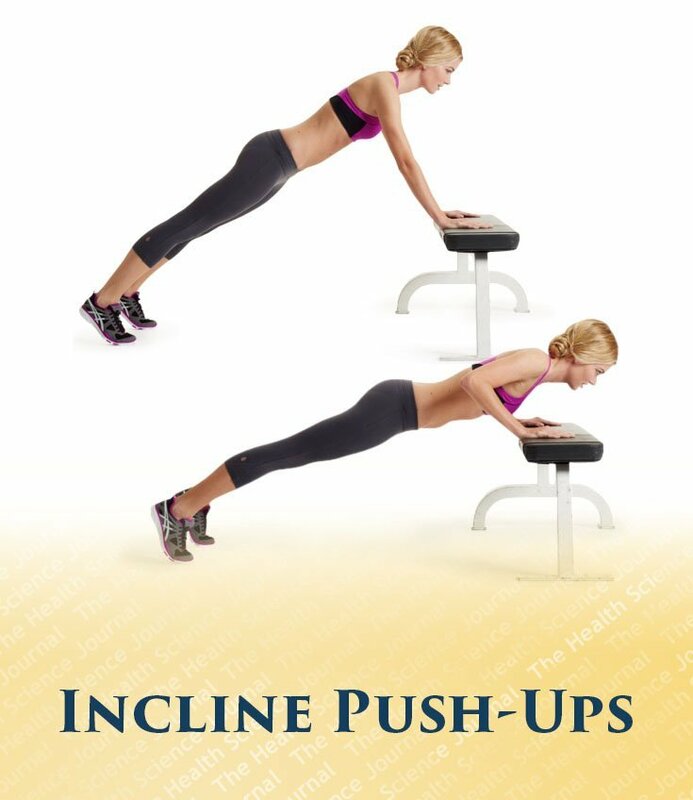 Incline push ups is the second exercise in a program which will consist of 10 levels and bring additional challenges from the 1st level (wall push ups): the increased tilt further loads the muscles of the upper body. Incline push ups are easier than the full floor push ups (5th level), which makes this a good exercise for beginners or people in recovery. For the majority of athletes, however, it won’t stimulate significant muscle workout. If you find them too easy, continue with the next level. During the incline push ups the body has to be positioned at a 45° angle to the surface. You can lower the difficulty by standing more upright and placing the hands a little higher. Once you familiarize yourself with the exercise, assume the starting position at a 45° angle, as explained above. If you lower the level of tilt, on the other hand, the push ups become harder. Think of the lowering of the level of inclination as using heavier weights in bodybuilding. After overcoming the Final level of the incline push ups continue with the next exercise – Knee Push Ups.